Moore & Lee is listed in the Chambers Guide to the World’s Leading Lawyers, USA, AV rated in Martindale-Hubbell®, The Bar Register of Preeminent Lawyers, The Legal 500® for Real Estate and Construction, and Super Lawyers®. Mr. Lee is listed in The Best Lawyers in America (2007-2018). Mr. Lee is also listed in Super Lawyers®, The Top Lawyers in Virginia (2006-2018), Super Lawyers®, The Top Lawyers in Washington D.C. (2009-2018), Who’s Who Legal: Construction 2018 and Super Lawyers®, Corporate Counsel Edition. Chambers, USA, “America’s Leading Lawyers in Business” lists Mr. Lee as one of the leading lawyers in Construction Law. Mr. Lee was selected as a Fellow by the Advisory Board of the Litigation Counsel of America. Charlie C.H. 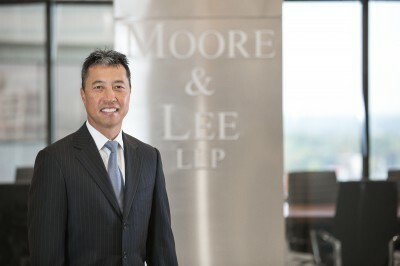 Lee is a founding partner of Moore & Lee, LLP. He practices in all areas of litigation, focusing in construction, long term healthcare law, and corporate and commercial law. Mr. Lee has vast and unique experience in representing large national corporations, healthcare and long term care institutions, privately and publicly owned senior care providers, hospitals, insurers, sureties, Real Estate Investment Trusts (REITs), investment and other private equity groups, developers, owners, and large scale general contractors. Mr. Lee has negotiated over 1500 settlements in business disputes, general and complex litigation matters, and class action suits. Throughout his twenty-eight year career, he has successfully managed, tried and appealed a variety of litigation matters around the country. His trial experience extends to various state and federal courts in more than 36 jurisdictions including California, the District of Columbia, Florida, Maryland, New York, Pennsylvania, Virginia, and various administrative boards of contract appeals. Mr. Lee’s appellate practice includes appeals in the United States Supreme Court, the United States Court of Appeals for the Fourth, Ninth, Eleventh and Federal Circuits, the Supreme Court of California, the Supreme Court of Florida, the New York Court of Appeals, the Supreme Court of Pennsylvania, the Tennessee Supreme Court, the Supreme Court of Virginia, California Courts of Appeal, Florida District Courts of Appeal, Indiana Court of Appeals, Maryland Court of Special Appeals, New York Supreme Court (Appellate Division), Superior Court of Pennsylvania, and Tennessee Court of Appeals. In addition to his litigation practice, Mr. Lee manages and coordinates legal matters on behalf of clients with a nationwide business presence. In that capacity, he oversees and coordinates the efforts of numerous outside counsel to ensure that unified and consistent positions are asserted on behalf of the client, that effective and efficient legal strategies are employed, and that legal spend is controlled. He regularly counsels clients regarding policies and procedures for multi-layered national corporations, including effectively minimizing litigation risks. He frequently lectures clients and industry professionals about litigation trends, recent case law, and best business practices to avoid litigation altogether. Mr. Lee is uniquely qualified to analyze, edit and revise legal documents that address current issues such as arbitrability, indemnification, waivers, risk allocation, limitations on liability, subrogation, and other current matters. He routinely assesses and manages liability and contract risks for owners, developers, contractors, sureties, REITs, self-insured corporations and insurance carriers providing primary and excess coverages. Mr. Lee’s experience allows his clients to effectively and efficiently manage risks in prosecuting and defending claims and lawsuits as well as provide stability and general predictability of exposure, if any. Finally, Mr. Lee has the privilege to serve as an arbitrator on the Construction Panel and Sports Panel for the American Arbitration Association. Mr. Lee is the founder and past-president of the Asian-American Bar Association of Virginia, and a member of the Virginia State Bar, District of Columbia Bar, Florida State Bar, Washington State Bar and the American Bar Association. County of Monroe v. Raytheon Co., 48 A.D. 3d 1237, 852 N.Y.S. 2d 549 (4th Dept. 2008). Bell BCI Co. v. Old Dominion Demolition Corp., 294 F.Supp.2d 807 (E.D.Va. 2003). Sunrise Assisted Living, Inc. v. Sunrise Healthcare Corp., 1999 WL 33798757 (E.D.Va. 1999). Vulcan Painters, Inc. v. MCI Constructors, Inc., 41 F.3d 1457 (11th Cir. (Ala.) 1995). Won partial summary judgment against an architect/engineer in the U.S. District Court for the Eastern District of Virginia on a $185 million condominium project leading to a multi-million dollar settlement. Won a multi-million judgment in Federal Court of Claims against United States on National Institute of Health project involving disruption, delay and cumulative impact. Won default termination case against the District of Columbia and obtained a multi-million dollar settlement on a wastewater treatment project. Won default termination case against the Department of the Navy in the Court of Federal Claims. Won federal bench trial against a major subcontractor on a $120 million prison project. Obtained multi-million dollar jury verdict against design builder on a residential project. Obtained a multi-million award in federal jury trial against design professional on a local jail project. Obtained summary judgment against defaulted subcontractor in federal court on a $160 million wastewater treatment project. Mr. Lee is a former five time world karate champion, a member of the Black Belt Hall of Fame, and holds a 8th degree Black Belt in Tae Kwon Do.